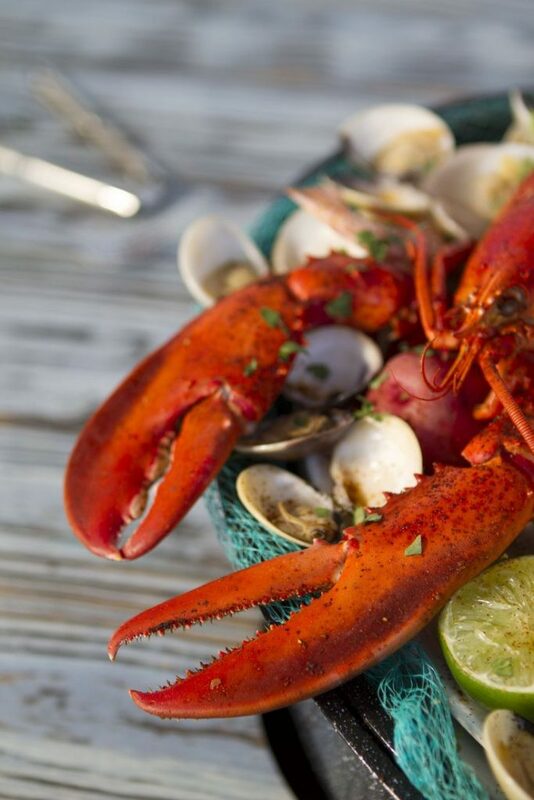 Entertain alfresco with a good old Nantucket Lobster Fest. Nothing beats a tender, fresh lobster cooked in a delicious white wine broth. We add clams to the mix but you can also add mussels and shrimp to the pot. For the recipe click on the more botton below. To compliment our Nantucket steamed lobsters, we roast red potatoes in olive oil, with a little garlic and rosemary. Then we steam some super sweet corn on the grill. Preheat grill to medium. Peel back the husks of the corn without removing them. Remove the silks and recover the corn with the husk. Soak in large bowl of cold water for 30 minutes to an hour. Remove corn from water and shake off excess. We like to wrap them in aluminum foil to steam them but you do not have to do this. Place the corn on the grill, close the cover and grill for 15 to 20 minutes. In large stockpot, combine white wine, water and seaweed or clam juice, garlic, parsley, salt and pepper. Bring to a high boil for 5 minutes. Pick up the lobsters and quickly place them head first in the boiling water. Cover and cook for 6 minutes. Add clams. Bring to a boil, and cook for an additional 6 minutes. When done, the lobster shells will be red and the tails will be curled, and the clams will open up slightly. Remove the lobsters and ingredients from the liquid and arrange them on serving platters. Pour on some of the flavorful broth and serve with crackers, bread and drawn butter.